Tamiya 1/16 105mm and Super Sherman Metal Idler Wheels Discounts Apply ! TAM84221 - Tamiya 1/16 105mm and Super Sherman Metal Idler Wheels. These die-cast metal idler wheels for the 1/16 scale R/C Sherman (item 56014 and 56032) features detailed moldings to provide the model with greater scale presence. 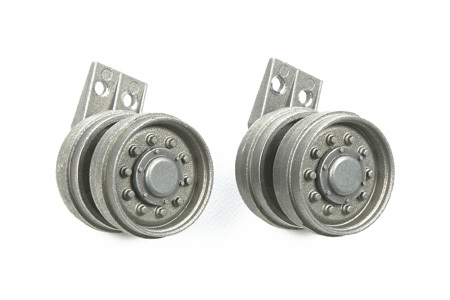 Each wheel is equipped with a ball bearing to enable smooth wheel rotation.